I also have a theory that anything sounds better in French. Case in point: ‘voulez vous coucher avec moi’ sounds much more seductive and thrilling than the somewhat needy ‘will you sleep with me?’ Just like ‘c’est la vie’ sounds sweet, while ‘such is life’ sounds patronising. I learnt a new French term recently that I might like as much as ‘pinot noir’: Cinq à sept (sank-ah-set). For those who studied French, you’ll know it translates to ‘five to seven’. And why is this period of time so iconic it deserves a phrase? It was traditionally the time French men visited their mistresses (oh la la la LA!). In more recent years, it has thankfully come to mean a time that doesn’t involve infidelity, and holds infinite more grace: twilight cocktail time. Cocktail “hour” arose in popularity in the ’20s, and is the time in which alcoholic drinks are enjoyed prior to dinner. It’s a time to unwind from your day, and to prepare for the dinner ahead (which may not necessarily be a the same place you consume the cocktails). Cocktail hour or, Cinq à sept (see, everything does sound better in French! ), is not merely “pre-drinks”. It has class. It has joie de vivre! It’s about enjoying a drink, and not just preparing to get wasted. One Sydney establishment who is bringing back the glamour – and who introduced me to the concept of cinq a sept – is the beautiful Ananas Bar & Brasserie at the ArgyleXchange. To encourage those in Sydney to embrace this concept, they are offering selected $15 cocktails, champagne, and Hors d’oeuvres during 5-7. While some may think this is just a pretentious way to re-brand Happy Hour, it’s so much more than that: while ‘Happy Hour’ conjures up images of standing squashed at a bar for fifteen minutes to be served whatever beer or wine happens to be overstocked, Cinq à sept is about savouring the house specialties, in an elegant and refined environment. For their champagne, you can not go past the ‘Marc ‘Initiale’ Brut’, which they exclusively import to Australia, and it’s going to have me running to them weekly, because it is definitely the Crème de la crème of wondrous bubbles – I’m pretty certain it’s made by French Angels in a field of rainbows and unicorns. You know who sometimes you have a really good kiss, and in the weeks that follow you’ll occasionally find yourself slipping thinking about it? I’ve been doing that ALL week over this champagne. Obsédé! 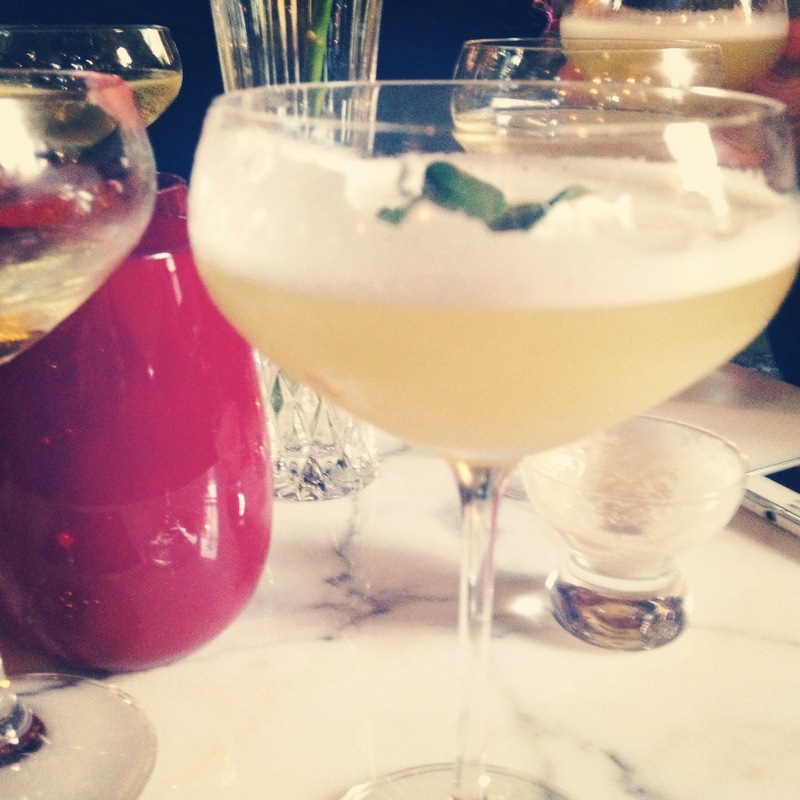 If you’re more of a cocktail connoisseur, you’ve definitely found your place. Ananas haven’t constructed a menu that is trendy or frivolous, they have instead put their own clever spin on classic cocktails. Their Blood Orange Cosmo is slightly more bitter and fresh than it’s contemporary, which is welcome as it cuts through a drink that can be quite syrupy. Their signature cocktail Absolutely Ananas (vodka, chili infused pineapple, bitters) is incredibly refreshing – it manages to be sweet, tart, and spicy all at the same time. From the champagne to the cocktails to the Hors d’oeuvres , to the decor to the staff, everything about Ananas is absolutely beautiful. Stepping into the bar area of the restaurant, you feel like you have been transported to Paris of years passed – if Woody Allen had been shooting Midnight in Paris in Sydney (shush, Baz Lurhman made Moulin Rogue work), he wouldn’t hesitate to use it in his set for one of the underground literati gatherings. I’m hoping many other places will lead by Ananas’ example and bring back this delightful period which is all about unwinding, talking about your day, and drinking a drink to merely enjoy it. So, perhaps this evening, you should indulge in a Cinq à sept. It’s what the French would do, after all. Bisous! This entry was posted in Culture, Featured, Food and tagged cocktails, dining, food, french, friday foodie. Bookmark the permalink.